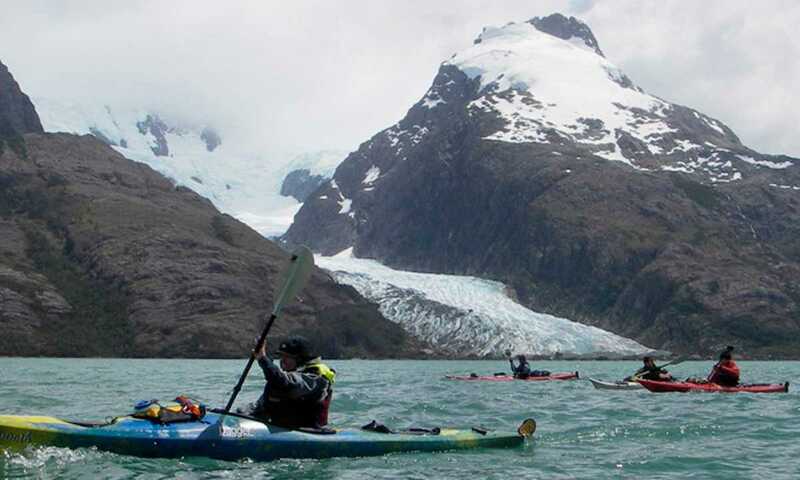 Kayaking the glaciers and fjords surrounding Puerto Natales in Southern Patagonia, you'll experience the remoteness of this beautiful place, spending your nights sleeping on a boat and climbing on Glacier Bernal on Day 4. Day 1: Our guide will meet you at the Punta Arenas airport. Transfer to Puerto Natales (3 hrs). Lodging & dinner at a local hostel with a meeting to discuss the trip programme. Day 2: Private transfer to Puerto Consuelo where our boat will be waiting with all the equipment prepared and ready to go. Once boarding the boat we will begin our navigation (8 hrs approx) to Canal de las Montañas crossing along the way the Montt Gulf and entering via the Kirke channel to be able to sail through the Morla Vicuña Pass. On entering the Canal we will anchor the boat opposite the Glacier Bernal, one of the 5 spectacular glaciers the we descend from the Sarmiento Mountain Range. Depending on the time that we arrive we can do a short trek to Los Huiros bay which is approx 40mins that leads us to original hand paintings left by the first Indian canoeists of Patagonia. This trek also serves as an orientation of the area. Lunch and dinner will be served aboard the boat. Dinner will be prepared and we will eat and sleep on our boat. Day 3: After breakfast, we´ll prepare the equipment and begin paddling across the canal with the view of Bernal Glacier and the Sarmiento Mountain Range behind it until we reach the entrance of the Cormorant Sanctuary where birdlife is abundant in this narrow passage and glaciers are hanging from the cliff rocks. Paddling further into this passage, passing between small icebergs along the way, we will be able to appreciate the view of Glacier Hermann with its vibrant blue tones until we reach the moraine which today is covered by water. We´ll look for a good spot to have lunch and then take some photo´s whilst admiring the beauty of this environment and the feeling of being in such a remote area. Dinner will be prepared and we´ll eat and sleep in our boat. Day 4: Today we will begin with a good breakfast and prepare the equipment for the entire days excursion on Glacier Bernal. We will cross the canal in a zodiac boat and begin a safe traverse ascending the glacier until a small plateau with the view of the whole canal below us! We will look at the different formations of this glacier to see the possibilities of ice climbing or simply advance further into the glacier between the crevasses and seracs, enjoying the incredible scenery and learning a little bit more about the anatomy of this glacier as we go along. At the end of our traverse we will return to the shore where our zodiac boat will pick us up and take us back to our boat for dinner and the night. Day 5: We will enjoy breakfast whilst our boat navigates towards our next adventure within this canal. We will anchor our boat near to Glacier Alsina and prepare to kayak in the bay of this glacier, after which we will paddle towards Glacier Paredes Bay. Once we enter the bay we are surrounded by tall cliffs (therefore enjoying some protection from the weather) we'll continue until we see one of the walls of this imposing glacier, a truly unforgettable experience. We'll look for a place to have lunch and a rest, then continue to enjoy paddling in one of the most incredible scenes in Patagonia! We´ll return to our boat to celebrate our last night with a special dinner in the Canal de las Montañas and the Sarmiento Mountain Range. Day 6: We'll have breakfast and then navigate to the end of Canal de las Montañas to enjoy the magical views on our last day before heading back to Puerto Natales (8 hrs approx). We will return via a different route, this time sailing through the Santa María Canal. The “Conjunto La Paz” (group of mountains) can be seen before arriving to the narrow White passage. We´ll cross once more the Montt Gulf and arrive to Puerto Natales. Transfer to your hostel for a farewell dinner and to spend the night . Day 7: Transfer to Punta Arenas.